Home AndroidNews What you really need to know about the Telegram Messenger ! What you really need to know about the Telegram Messenger ! Telegram Messenger is an instant messaging app that uses phone numbers (or optionally usernames) to connect users. With Telegram, users can send messages, pictures, videos, audios and any other type of file. The instant messenger app category is a hotly contested field, and some of Telegram’s competitors include WhatsApp, Google’s Hangout, BBM, WeChat, Facebook’s Messenger and LINE (among many others). Telegram Messenger launched in 2013, created and backed financially by Russian billionaire brothers Pavel and Nikolai Durov, the founders of Russian social networking site VKontakte who wanted to build a communications system that couldn’t be accessed by the Russian security agencies. It is built on the open source MTProto protocol. Telegram boasts of being fast, reliable and available on (and accessible from) multiple devices at the same time. It also uses a distributed server architecture with multiple data centres spread out in different jurisdictions around the world. Telegram has also promised to never sell ads, will not accept outside investment and cannot be sold. Since the protocol is open source, independent developers are allowed (and encouraged) to build third party clients on the platform. Telegram is available for Android, iPhone, Windows Phone, Linux, Windows, OSX and via the web. To begin using Telegram, you must register with a phone number. The phone number then becomes the your identity on Telegram. In addition, you can set a username through which other users can connect and chat without having access to the phone number tied to the username. Usernames are optional and can be deleted at anytime by simply saving an empty username. 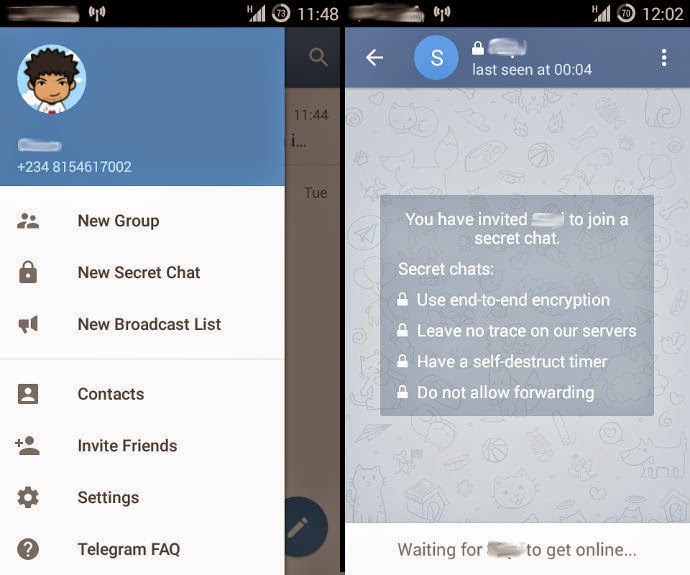 Telegram has Secret Chats which are conversations between users that make use of end-to-end encryption. That is the chat is visible only to the two parties involved in the discussion, and even Telegram servers cannot view the contents of the chat. When a secret chat is set up between two devices, Telegram helpfully generates a picture visualization of the encryption key for the chat, which both users can compare, and if the image matches, then the chat is secure. For secret chats, a self destruct timer can also be set on messages. This has to be set before the message is sent. The timer begins when the recipient views the message, and when it runs out the message is deleted from both devices. Photos sent with a timer less than one minute can only be viewed while holding a finger on them, and helpfully Telegram notifies the sender if a screenshot is taken.